Think you’re invincible? You’re not alone. Most working Americans drastically underestimate the odds of experiencing an income-interrupting injury or illness that will last an extended period of time. Now consider that more than one in four of today’s 20-year-olds will have their income interrupted by a disability before they retire. That’s because some top causes of long-term disabilities aren’t catastrophic accidents, but common, everyday health issues like back pain, heart disease, arthritis, cancer, even pregnancy. No matter how healthy, everybody has a risk that is too high to ignore. You’ve probably protected your most prized possessions from damages and accidents, but what about the resource that makes all others possible — your paycheck? 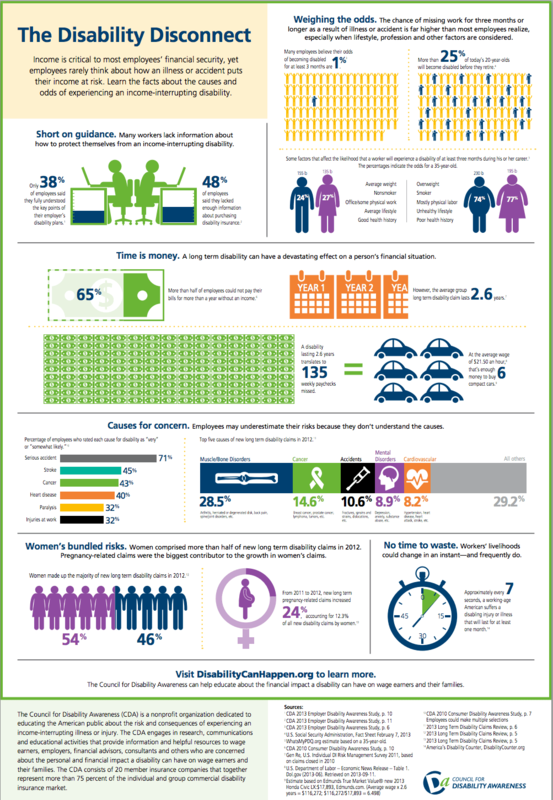 Learn more about the causes of disability and how you can defend your income from them at DisabilityCanHappen.org.